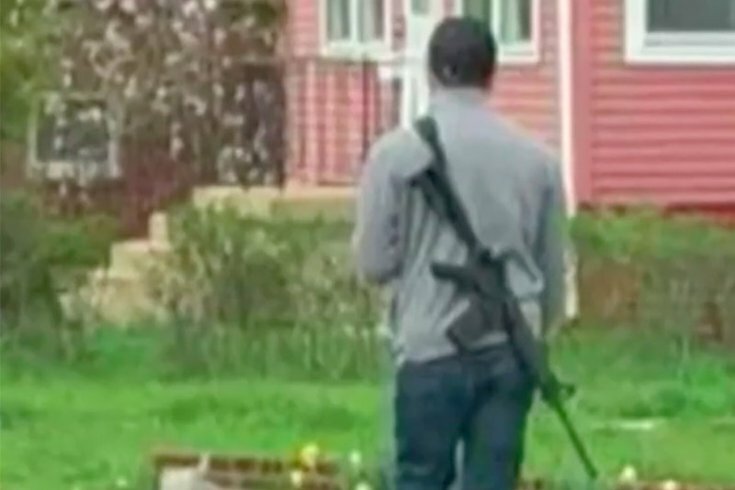 The man who caused alarm in Abington Township by walking streets with an AR-15 slung over his soldier is undergoing a psychiatric evaluation, according to police. The man was taken into custody by police Thursday morning on a warrant for an involuntary, 72-hour psychiatric evaluation at Norristown State Hospital after friends reportedly expressed their concern to police via Facebook that a change in the man's behavior could pose a threat to himself or others, police Chief Patrick Molloy told reporters on Friday afternoon. He has not been charged, but a search warrant was executed at the man's home and the assault rifle was confiscated, Molloy said. While he was not identified by police, the man has no criminal history and has lived in the township for several years, according to Molloy. "This individual’s decision to exercise his rights does not, by itself, warrant an involuntary mental health evaluation," Molloy said. "However, additional information was received which warranted steps to be taken for his safety and the safety of our citizens." On Thursday, Molloy disputed what he called "false information" being spread by some residents about the department's investigation. It's unclear specifically what that information was, but PhillyVoice reported Thursday morning that on the police department's own Facebook page, two residents posting in the comments reported that township officers had the man under surveillance overnight Thursday and then took him into custody in the morning. "It was reported by a resident that this individual was arrested and released by this department today. This fact is simply not true. We continue to investigate this matter and collect as much information as we can." Molloy did not respond to PhillyVoice's request on Thursday afternoon for more information about the status of the police investigation. Police received multiple reports on Friday and Monday of the man walking around with assault rifle visibly across his back. He was photographed on North Tyson Avenue, but was spotted in North Hills, Ardsley, Glenside and the Abington Shopping Center, police reported Monday. Social media reports indicated he entered the CVS Pharmacy in Ardsley. A number of residents were alarmed by the news, and many took to social media to express their fear of the situation. One mother wrote on Facebook that the man's behavior was "clearly frightening people. I heard he walked near the Roslyn playground just hours after I was there with my 2 year old. Had I seen him go by, I would’ve grabbed my kid and ran for the car in a panic." The man is known to police as a gun-rights supporter. "While this individual’s intentions are unknown, it appears that he is attempting to draw our police officers into a debate or an encounter over his 2nd amendment right to carry this weapon in public," the chief said in Monday night's letter. "All of our officers are well aware of this passive-aggressive tactic, as they have been videotaped during at least one encounter with him." Molloy urged the public to resist taking any action against, or even speaking to, the man. Residents who feel their safety is threatened by the man should call 911 and an officer will be dispatched immediately, he said.